That was a very worthy achievement for our Amsers, who have a passion for science. On March 17th and 18th, 2012, the national round of the Technology & Science Competition for high school students took place at Viet Duc High School. Hanoi – Amsterdam High School’s topic has made an outstanding impression at this competition. On the first day, many schools participated in the drawing competiton to present their schools through those paintings. 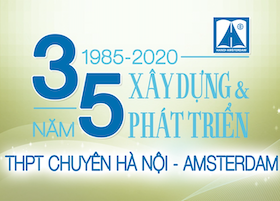 Hanoi – Amsterdam High Scholl took the idea from the drawing at the previous round: the scent of Ams the sail, regarless of rogue waves, heads to the vast ocean, integrating with the development of world science. On Sunday, March 18th, 2012, the most impressive presentations chosen by the judges had the chance to present more about their topics. Two out of three topics of our school were chosen to be presented in this round. On Sunday afternoon, March 18th, 2012, the Award Ceremony took place. The first victory came to Phan Dung Minh, Nguyen Thuy Linh and Nguyen Anh Quan (10 Biology) when they claimed the consolation prize. Next, Ngo Huong Tra (11A2), Le Khanh Ngan (11A1) and Dang Thu Thao (11H2)’s “Planting vegetable combining planting mushrooms and composting to thoroughly make use of used tissue” gained the second prize for our school. The third topic of Hanoi – Amsterdam High School – Tran Bach Trung, Bui Thi Quynh Trang and Vu Anh Vinh (11 Physics)’s “Transforming brine into fresh water based on vacuum-pump technique and solar ênrgy” excellently won the grand prize in the field of thermal, hydraulic and water treatment. The students were proud to be offered scholarships from the Yale Association. Amsers’ dynamism, creativity and the passion for science were proved with those most persuasive evidences in a national competition. With the belief that science was the key to a better life, those excellent Amsers achieved pride and glory for Hanoi – Amsterdam High School for the Gifted.